The flop was best for Berda, running A 2 6 to give him a pair of aces and Kochelaevskiy a pair of sixes. The turn brought the 3 and Kochelaevskiy needed to see a ten or six on the river to stay alive. The 7 fell instead, and Kochelaevskiy was eliminated in second place, winning $510,939. Berda took down the event, the $825,976 first-place prize, and his first career WSOP bracelet. The A 2 3 hit on the flop and Porter needed running cards to stay alive. The A turn left Porter drawing dead and the 5 river finished the board. Porter finished in third place for $353,260, leaving Vladimir Kochelaevskiy and Tomer Berda heads up. Kochelaevskiy had 9.8 million to Berda’s 4.8 million in chips. The remaining three players are putting food in their bellies. They’ll be back in an hour. Stay tuned to see who will take down event No. 56. The board missed everyone, running 2 2 5 6 4 to give Porter the best hand and eliminate Wattel in fifth place ($186,250) and Bonavena in fourth ($254,777). Hung was trailing and found no help on a flop of 7 6 8 . The 3 on the turn left Hung with one last chance to hit a jack or queen, but the 10 finished the board and Hung was the sixth-place finisher, earning $137,496. The flop didn’t bring any help for Curcio, running 2 K 2 . The 9 turn left him drawing to two outs but the river was the 8 and Kochelaevskiy hit the unnecessary flush to eliminate Curcio in eighth place, for which he’ll take home $78,705. Tomer Berda raised to 200,000 and when action folded to Ali Alawadhi he made the call from the big blind. The 9 fell on the turn to pair Alawadhi and give him even more outs, but the J on the river was not one of them. Alawadhi was gone in seventh place, taking $103,527 with him. Berda had around 3 million in chips after the hand. Wattel was the favorite, and Amendola needed some help. The board ran 3 10 9 Q 4 and Amendola could only muster a pair of tens. Wattel’s kings held up, doubling him to 720,000 in chips. Amendola had just 550,000 after the hand. The flop ran 9 2 K , pairing Curcio and putting him far ahead in the hand. The 7 turn left Amendola drawing dead and the Q river finished the hand. 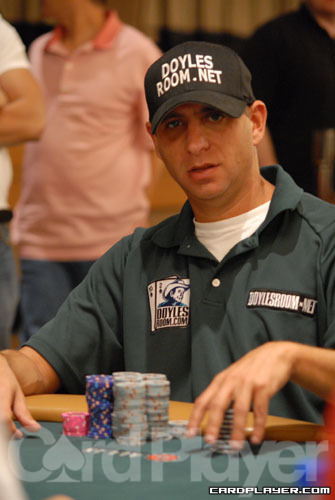 Amendola was the first elimination from the final table, making $60,580. Wattel was well ahead with his aces, and the board kept it that way. It ran 5 10 6 2 2 and Wattel doubled for a second time in first level, chipping up to 1.2 million. Curcio dropped dangerously low to just 115,000. Action is now under way at the final table. Stay tuned to CardPlayer.com for live updates on the eliminations. The final day of event No. 56 is set to begin at 3 p.m.
Only nine players remain, and they’ll play for the $825,976 first-place prize and WSOP title. Salvatore Bonavena takes a large chip lead into the final table.